Sail. Swim. Snorkel. Fish. Kayak. waterfall Hike. Wildlife. Sun. Sand. 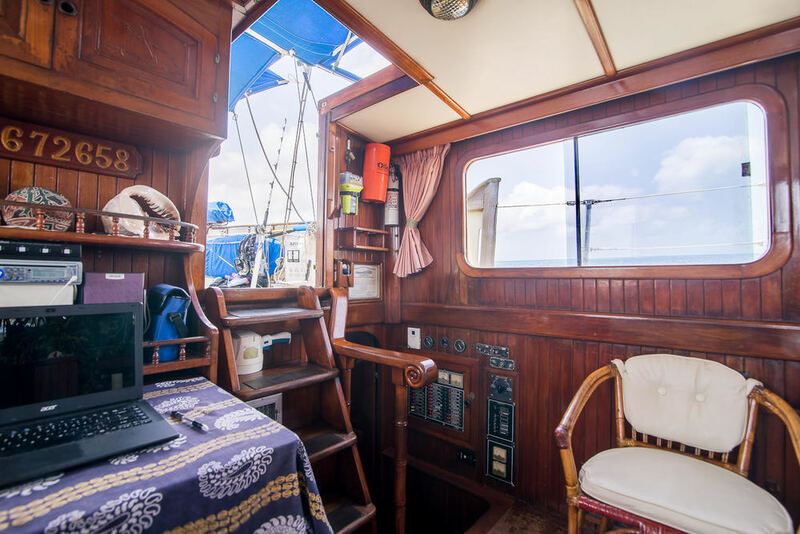 During your stay aboard our 52 ft. cutter rigged pilothouse ketch sailboat, you will enjoy the beauty, warmth unforgettable vistas of a land still secluded. Still untouched by the mainstream, the sunny San Blas islands in the Republic of Panama play host to a breathtaking scene that will stay with you forever. From sailing, snorkeling, fishing and kayaking to waterfall hiking tours, there is something here to make your stay truly your own. Is there a concern about hurricanes? One of the really great things about living in the San Blas Islands is the lack of hurricanes. At less then 10 degrees latitude, we are too far south west to worry about hurricanes. urge everyone to donate generously to the cause. We have been living aboard a series of four different "Blue Skys" over half our lives. Most of our time has been spent cruising Florida and the outer islands of the Bahamas while raising our son Josh. We love the water and are avid snorkelers and certified scuba divers! Our son is now grown and off being a busy marine biologist and scientific scuba diver. We have been cruising the Western Caribbean since 2004 with a lot of really cool stops, starting with the Dry Tortugas, Mexico, Belize Guatemala, the Bay Islands of Honduras, and a little chain of Colombian islands which include Providencia and the Albuquerque Cays. A perfect view of one of the islands!! Eventually, several years ago, we ended up in Panama. While Panama travel is unlimited, San Blas sailing is the best! The San Blas islands are located off the Caribbean coast of Panama. The San Blas is an archipelago of over 340 islands stretching east and west for 100 miles. They are home to indigenous Kuna Indians who have best preserved their culture and traditions of all the tribes in the Americas. We do answer emails as quickly as possible, however it may take a day or two to get back with you. Such is life at sea! Click above to visit our Trip Advisor Listing. This shot was taken by a guest on his iphone! This is how real it gets! Things to do while you're with us. A familiar view from the islands. Blue Sky is a very large custom built boat, 52 ft. in length, and 16 1/2 ft. beam (width). Due to the boat's size and width, she is very stable, much like a catamaran, and does NOT heel (tip) over when sailing! This makes a very good alternate to the expense of chartering a catamaran! While scuba diving is prohibited here in the San Blas, we can still enjoy some fantastic snorkeling! We love giving guided snorkeling underwater tours! Have you ever swam with eagle rays, held a brittle starfish while it wraps around your hands, played "peek-a-boo" with sea anemones, or snorkeled on a wreck? Snorkeling in the islands: The same barrier reefs that stop the ocean swells also help to protect the inner coral reefs from being damaged by surge. The tropical fish under water plant life and coral formations are spectacular in the crystal clear water. There is little concern about predator fish. A video made by one of our friends while snorkelling with Blue Sky. We combined sailing and fishing because, well, any time we're sailing, we're always fishing! As the saying goes, "you aren't catching if you're not fishing"! We love the delicious lobsters. We also respect the "closed season" from March 1st to June 1st in order so they may have time to reproduce. The months from Dec. to April are when we get our best sailing winds; we call them the Christmas trades. That's when we love to sail behind the Naguargandup Cays chain enjoying sailing in 15 to 20 knots of wind in smooth waters! When Debbie was a small child, her father built several ocean-going Folboat kayaks, both singles and doubles. They were made with wooden frames covered with Nagahyde. So Debbie had her own kayak at the tender age of five! The kayaks we carry onboard Blue Sky are two brand new lightweight modern day 9 ft. Emotion plastic one person sit atop style. The ocean barrier reefs surrounding the San Blas archipelago offer protected waters and endless tranquil uninhabited islands, making ideal locations for kayaking. We often take off for the day circumnavigating different islands, gliding over the deeper coral reefs! Blue Sky's dive platform makes for easy embarking and disembarking directly from the boat. 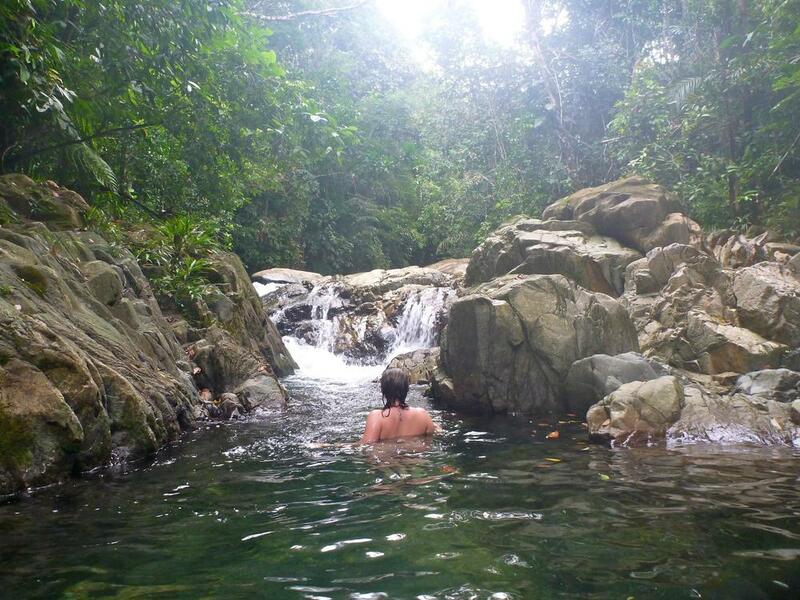 We can arrange waterfall trips with one of our Kuna friends. The trips take about 4 & 1/2 hrs. Lisa, our Kuna guide, picks up guests from our boat anchored off of Isla Sarladup in her motorized launcha boat between 8:00 and 8:30 a.m. It's a 20 min. boat ride to the mainland, then a bit of a ride up the Rio Sidra. After that, you hike up the mountain past a large Guna cemetery then on to the waterfalls. Lisa your Guna guide, gives you an informative discussion of the different medicine plants and local traditions along the way. Coming down the mountain, you'll both swim and walk thru the river! Lisa's helper will carry your backpacks on the way back down the river path. We'll supply a boxed lunch and water for you to carry on your hike. *These trips are "weather permitting only". Cost for this tour: $25 to $30 per person; however, Lisa needs a $100 minimum per trip. Lisa also needs 1 week's advance notice. 100% of the proceeds go directly to Lisa and her community island of Rio Sidra. We spent a wonderful week cruising with Debbie and Breeze. Plenty of good food, good snorkeling, kayaking, sailing and good company. We do our very best! Please consider leaving us a review! Our friend Rosalinda in the Coco Banderos. We will do our very best to make sure you have the trip of a lifetime! When you come aboard the Blue Sky, you come aboard not just a boat but a home. We welcome you, and will do out very best to make you feel at home here too. From taking your input on activities, to catering to dietary concerns, we want you to have the very best trip with us that you can. SEE some others that have joined us. Ken (Breeze) holds a current 100 ton U.S. Coast Captain's Guard License. He was born in Key West, FL and grew up as a "Navy brat". He went to school in different parts of the world, including Puerto Rico and Balboa High School on the Pacific side of Panama's isthmus in the Panama Canal Zone. Breeze crewed on a racing boat out of Melbourne FL and volunteered his help with the children's sailing program in Captiva Is., FL. Debbie worked from 1990 to 2004 as dockmaster, waitress, and eventually bar manager at the Captiva Island Yacht Club in Captiva Is., FL, taking the summers off to cruise the Bahamas out islands with her family. Breeze and Debbie both have extensive restaurant and yacht club experience. Both have catered for private parties and gourmet sunset/dinner cruises aboard Blue Sky. Blue Sky is a 52' cutter-rigged pilot house ketch, custom built in Taiwan as a private owner's yacht. She features extremely large well ventilated cabins with opening overhead hatches, portholes, and fans. With a 16 1/2 ft. beam (width), Blue Sky is a very stable boat that does not heel over while under sail, much like a catamaran. Blue Sky's interior is lovingly varnished teak with hand-carved doors, stained glass, and lots of plants. All interior cabins offer over 6 ft. of headroom. The 14 X 14 ft. aft deck is very cool and breezy, with an oversize removable awning. It has a dining table and chairs with seating for 6 or more people. The aft deck is surrounded by a white 2 1/2 ft. tall enclosure. Blue's wide decks are uncluttered and surrounded with double life lines. We cook all our meals aboard and are very sensitive to dietary restrictions and allergies. If you have particular food needs, we are happy to accommodate them. However, we need advanced warning. Please try to give us at least 2 weeks notice, if there is something you can not, or simply don't care to eat. The extremely large king stateroom makes a very romantic honeymoon suite! It's nearly as big as a hotel room. The private stateroom aft (11 ft. X 13 ft.) with King size bed and private en suite bath. The overhead stained glass opening hatch and two fans will keep you cool. Please contact us regarding rates. Plenty of room for two in the queen stateroom! Private stateroom (8' X 10') with Queen size bed and shared bath forward and butterfly opening hatch overhead and fan . Blue Sky's spacious main saloon with large opening windows is a great place to relax while waiting out the occasion rain shower! Ask about special children's rates. Raised main saloon (10' X 14') offers a 360 degree view out of large pilot house opening windows and dinette table seat 6 guests for inside dinning when necessary. 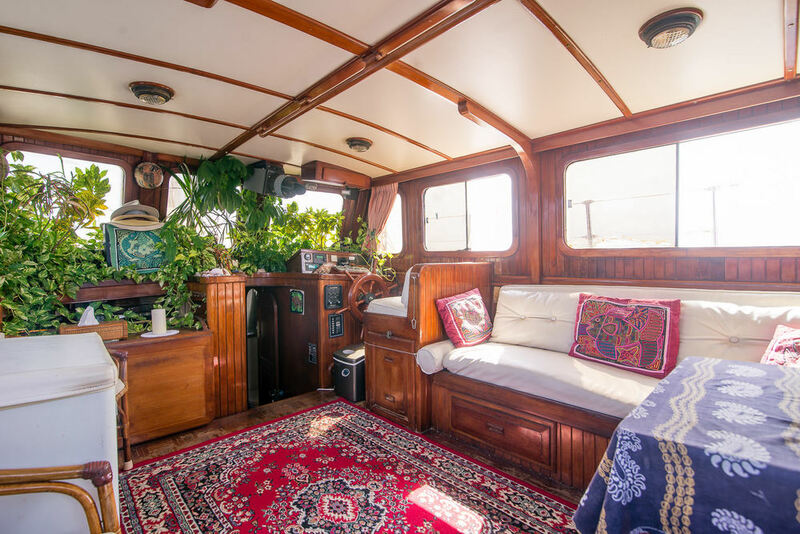 The fore deck is a great spot for sunbathing, reading or a snooze. The dive platform with two ladders offers easy access to the water and into the kayaks. The bow pulpit is always the favorite spot for photos and simply hanging out while under sail. Happy honeymoon! Kids are always welcome aboard Blue Sky! "And they fly thru the air with the greatest of ease!" The Kuna women are taking part in a Chicha Fest, soon their bowls will be filled with Chicha, an intoxicating beverage. The fest celebrates the time a young girl becomes a woman. It involves much drinking, smoking and dancing! 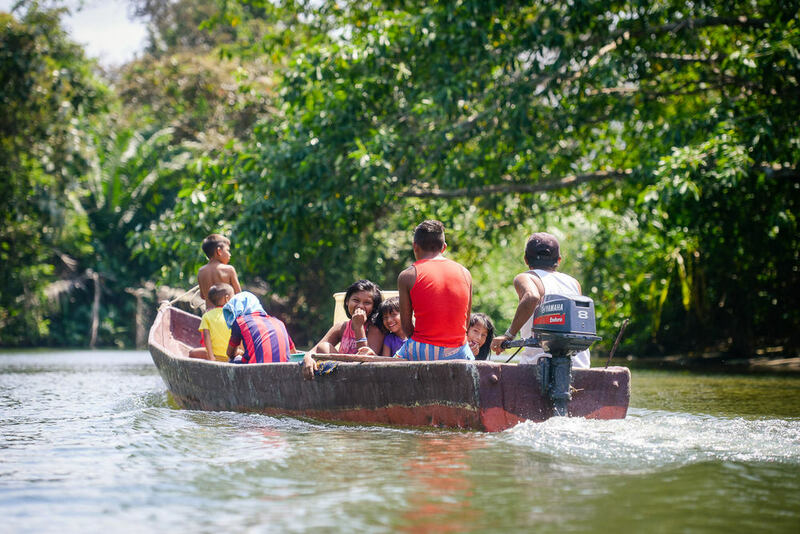 The San Blas archipelago, home to the Kuna Indians, consists of over 340 islands stretching east and west for over 100 miles, home to the indigenous Kuna who proudly preserve their culture and traditions. Today the Kunas' income consists of selling coconuts to Colombian trading ships, fishing, and tourism. In matrilocal Kuna society, women play an important role and contribute significantly to tribal income by selling molas. These elaborate hand-stitched embroidered cloth panels depict unique images of Kuna life past and present. Molas are part of a traditional woman's costume. ceremonies and an elaborate community party, a chicha festival. The girl, now ready for marriage, puts on her complete mola costume for the first time and chooses her adult name. Please get in touch! 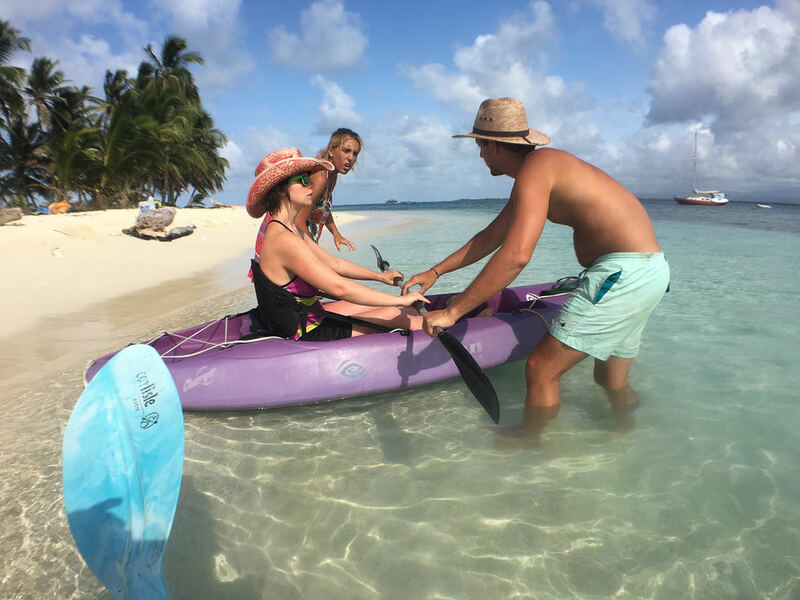 Let your San Blas Islands, Guna Yala, Panama adventure begin! No sailing trips offered to or from Colombia. Please get in touch. Bluesky Sailing.